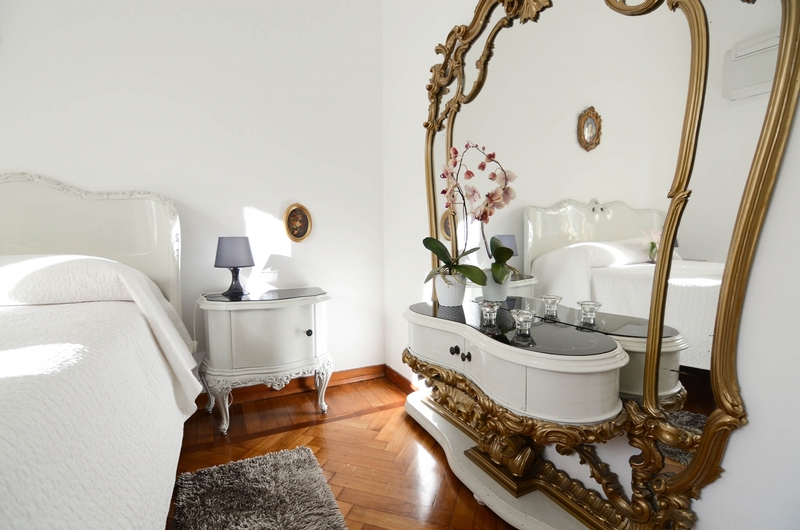 Entering the apartment you get the corridor, from the first door you reach the large, bright and romantic bedroom with its antique style and large bed, parquet floors and a large window overlooking the garden and park on back of the property. Equipped with a flat-screen TV, antique furnishings give a romantic touch. Next to the bedroom there is the living room which offers a table and an elegant tea corner with velvet armchairs. The large windows fill the living room of a beautiful natural light, as well as the kitchen and the bedroom. The bright, compact kitchen offers a microwave, kettle, toaster and everything you need to cook. All is completed by the large modern bathroom with Italian shower cabin and tiles. FAVOLA, one of our three most elegant apartments, is located on the first floor of a historic building, known for past events to host the Bellagio's Casino, after 2 steps of stairs, you will reach the entrance landing which is shared with 2 other my apartments, MERAVIGLIA and SOGNO. There are several restaurants and bars just a short walk from the apartment as well as a beautiful wine bar, so there is no need to venture far away to find fun and good food.